Buildings and Grounds - Brighton technical school, Victoria, Australia. Postcard on the back cover of the 1988 "Seaspray", the Magazine of the Brighton Technical School. "Cora Lynn" Brighton Technical School (Girls'). 45 Cochrane Street, Brighton, Victoria. Artist : Pham Mahn Cuong. T.O.P. Art Student at Brighton Technical School 1988. "Southern Cross" 2nd. August, 1995. OPEN SPACE TUSSLE AT OLD BRIGHTON TECH SCHOOL SITE. By Jan Price. People living near the former Brighton Technical School in Cochrane Street are stepping up their fight to have the remaining school building demolished to make open space. All but one of the buildings on the old school site have been demolished, leaving only the 1920s. trade school building in Berwick Street, used until recently as a council-run library. Bayside Commissioner Morton Browne has told residents the trade school had "served it purpose" and was likely to be sold. Tovell Street residents Wendy Dare and Doris Page said this week more than 80 percent of residents surveyed in Vaucluse, Berwick and Tovell Streets near the site wanted the trade school building turned over to public open space. A petition of 60 signatures was tabled at Bayside council three months ago. Brighton Historical Society president David Bick wants the trade school retained as an example of a 1920s. public building. Mr. Bick has prepared floor plans and suggested selling it for redevelopment as flats, within the shell of the existing building. The area will be subject to new drainage works to cater for stormwater from the St. James Park Estate. Estate subdivider Bruce Hamilton has asked council to build a two-metre drain easement between Tovell and Berwick Streets and along Vaucluse Street to New Street. Residents fear development at the site could endanger mature sugar gums in Tovell Street, at the western boundary of the land. Former assistant State Botanist Dr. Jim Willis last week gave the stand of 80-year-old sugar gums a clean bill of health. Dr. Willis said that although scarred and mis-shapen through poor pruning over many years, they were not diseased. Demolition workers raised more than $30,000 from building materials salvaged from the 1880s. villa Cora Lyn (sic.) at the former school, including $12,000 for the lantern roof, timber dado and mantelpiece in the billiard room. A Brighton resident bought the villa's magnificent hall mirror. ​Brighton Technical School, 45 Cochrane Street, Brighton, Victoria. Girls' School - "Cora Lynn". The glass-house which was used as the horticulture class-room. Photograph courtesy of Judy Whitaker. 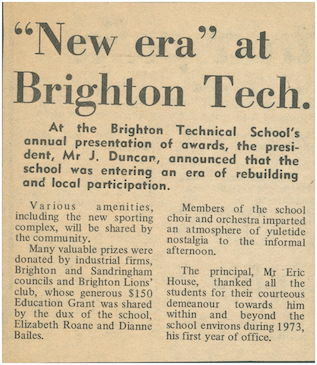 The Brighton Technical School Hall, which can be seen in the background of this photo, opened on 11 December, 1969, at 2.30 pm. Brighton Technical School. Girls' School. "Cora Lynn" 45 Cochrane Street, Brighton, Victoria. 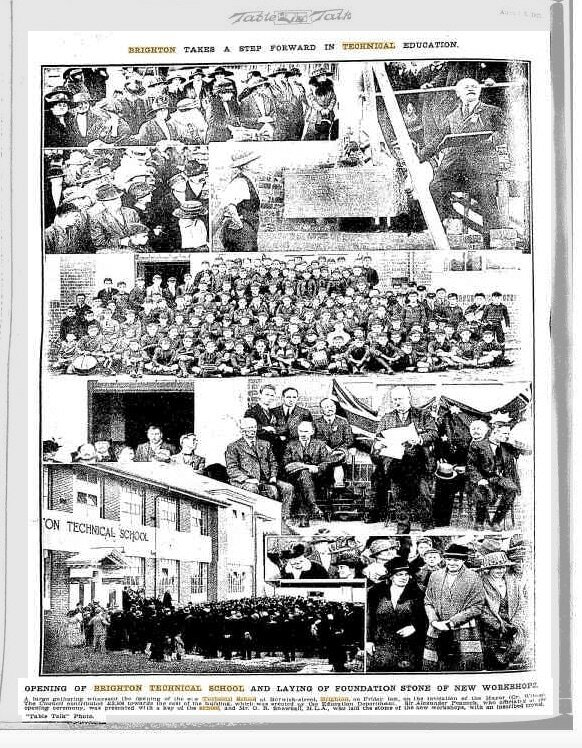 "Brighton Southern Cross" newspaper. 1st. October, 1921. Page 1. 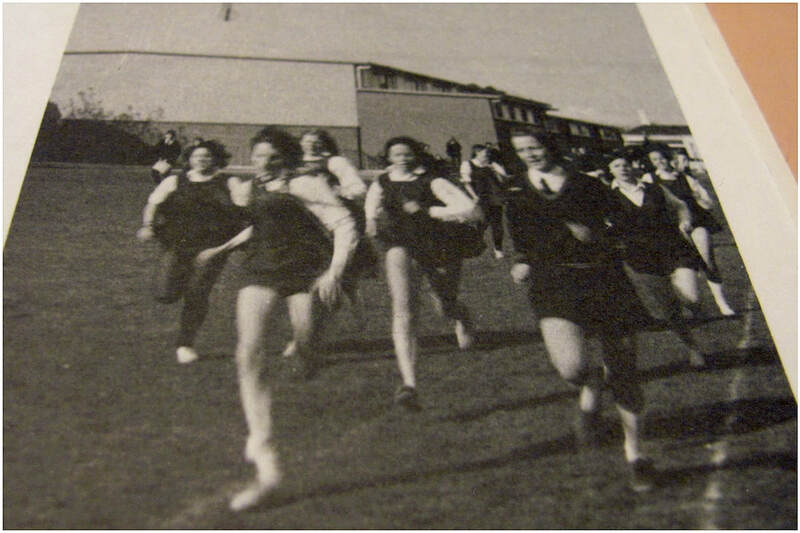 Heading - "Brighton Technical School. Students Eager for Enrolment. Mr. Snowball's Untiring Work. Cr. Grout Warmly Congratulated. "Cora Lynn" Estate Purchased. A Koelreuteria paniculata tree growing in Cora Lynn Park, St. James Park Drive, off Cochrane Street, Brighton, Victoria. Formerly the site of the Brighton Technical School. The Koelreuteria paniculata was propagated from the tree in the centre of the lawn in the Girls' Brighton Technical School, 45 Cochrane Street, Brighton, Victoria. Photo taken on 28 September, 2016. Plaque located in Cora Lynn Park, St. James Park Drive, off Cochrane Street, Brighton, Victoria. Formerly the site of the Brighton Technical School. Note : The name of the Brighton Technical School was changed to Brighton Bay Secondary College, on 20 December, 1989, when the notice appeared in the Victorian Government Gazette. The school officially closed in 1991, not 1989 as recorded on the plaque. Photo taken 28th September, 2016. Palm tree growing in Cora Lynn Park, St. James Park Drive, off Cochrane Street, Brighton, Victoria. Formerly the site of the Brighton Technical School. The palm tree was transplanted from the Girls' Brighton Technical School, 45 Cochrane Street, Brighton, Victoria. Photo taken 28th September, 2016. "New Era" at Brighton Tech. 1973. Article refers to: President Mr J Duncan, dux Elizabeth Roane, dux Dianne Bailes, and principal Mr Eric House. 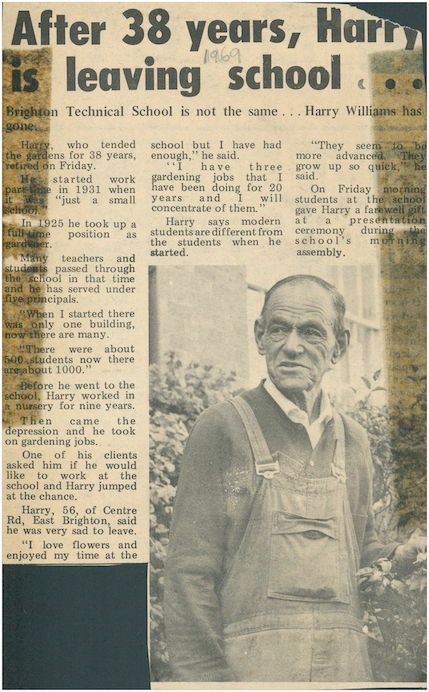 After 38 years, Harry is Leaving School. 1969. Harry Williams. Brighton Technical School. Boys' School. Berwick Street, Brighton, Victoria. Ample playing spaces about the Boys' School. 1938 "Sea Spray" Magazine. Brighton Technical School. Boys' School. Berwick Street, Brighton, Victoria. Not a War Ruin - Reconstruction. 1939 "Sea Spray" Magazine. Brighton Technical School. Girls' School. "Cora Lynn". 45 Cochrane Street, Brighton, Victoria. Sketching Out Of Doors. Form 4B. Note the glass house in the left background. It was the Horticulture Classroom. 1955 "Sea Spray" Magazine. "Table Talk", Thursday, 3rd. August, 1922. Page 18. "A large gathering witnessed the opening of the new Technical School in Berwick Street, Brighton, on Friday last, on the invitation of the Mayor, (Cr. Wilson). The Council contributed £3,800 towards the cost of the building, which was erected by the Education Department. Sir Alexander Peacock, who officiated at the opening ceremony was presented with a key of the school, and Mr. O. R. Snowball, M.L.A., who laid the foundation stone of the new workshops, with an inscribed trowel."